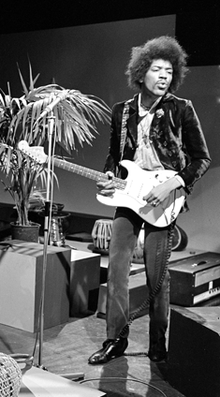 ↑ "Hendrix Voted World's Best Guitarist"". Sky News. สืบค้นเมื่อ 2009-07-13. ↑ "Hendrix hits top note again as best guitarist in history". The Independent. 28 August 2003. ↑ "Jimi Hendrix". Encyclopedia Britannica. สืบค้นเมื่อ 2009-07-13. ↑ "Jimi Hendrix's Influence on Jazz". allaboutjazz.com. 2008-09-05. สืบค้นเมื่อ 2009-07-13. ↑ Egan, Sean (2002), The Making of Are You Experienced, A Cappella books. ↑ Shadwick, Keith (2003), Jimi Hendrix, Musician. Backbeat Books. pp. 39. ↑ Blues CD, MCA, โน้ตบนปกโดย Jeff Hannusch, pp. 2. ↑ A Film About Jimi Hendrix deluxe edition. DVD, Warner Bros. sp. feat: From The Ukelele to the Strat, Faye Pridgeon Interview. ↑ "The 100 Greatest Guitarists of All Time". Rolling Stone. August 27, 2003. ↑ Hendrix, Janie L. "The Blood of Entertainers: The Life and Times of Jimi Hendrix's Paternal Grandparents". Blackpast.org. สืบค้นเมื่อ November 15, 2012. ↑ Hendrix's paternal grandmother, Zenora "Nora" Rose Moore, was a former vaudeville dancer who moved to Vancouver, Canada, from Tennessee after meeting her husband, former special police officer Bertram Philander Ross Hendrix, on the Dixieland circuit. Nora shared a love for theatrical clothing and adornment, music, and performance with Hendrix. She also imbued him with the stories, rituals, and music that had been part of her Afro-Cherokee heritage and her former life on the stage. 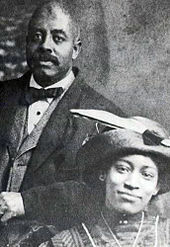 Along with his attendance at black Pentecostal church services, writers have suggested these experiences may later have informed his thinking about the connections between emotions, spirituality, and music. หน้านี้แก้ไขล่าสุดเมื่อวันที่ 23 ธันวาคม 2559 เวลา 23:07 น.